Video can be a great conversation starter and the right clip, from a movie or TV show, can often sum up feelings that words can’t always describe. But getting the right video to share, especially on a mobile device, can be hard. But New York City startup GorillaSpot Media has created a new mobile video app called Cliptamatic that looks to combine some of the short communications and sharing of Twitter with branded premium video like Hulu. 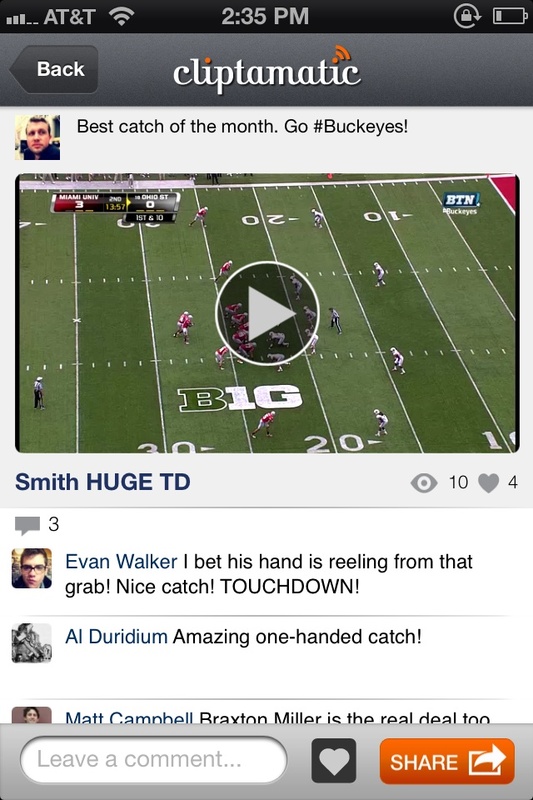 The goal is to make concise premium video a kind of language that inspires reactions and gets people talking. The app, available for the iPhone (s aapl), will start with a limited selection of election news, sports and comedy clips, usually no more than 30 seconds long, but will soon expand to movies and TV content. Here’s how it works: users can choose to follow sports clips from the Big Ten Network to start, subscribing to their favorite conference team’s channel or they can choose from a variety of 2012 election issues, which includes curated content selected by GorillaSpot. There’s also comedy content from Latham Entertainment, which owns the Kings of Comedy and other properties and provides channels for Bernie Mac, George Lopez, Steve Harvey and other comedians. When new clips become available, users get alerted based on their subscriptions. 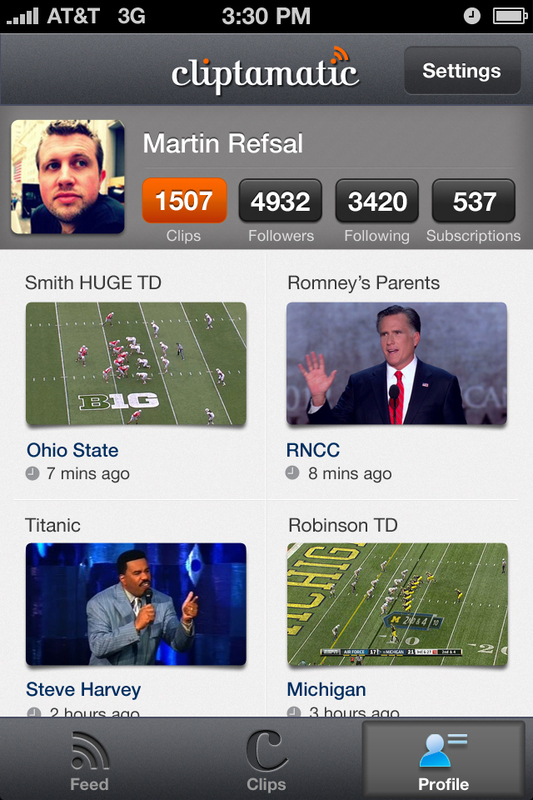 They can also follow other users and see what they’re sharing or find what’s popular in the Cliptamatic network. When a user finds a video they like, they can easily share it out to Facebook (s fb) or the Cliptamatic feed with their own caption. The videos will run inside Facebook. Twitter integration is coming soon. Cliptamatic has limited utility at launch because of its smaller library of content. And if it stays this small, it’s not going to be very useful for people. But there’s reason to believe this can be a more widely used tool because of GorillaSpot’s experience in the premium video world. GorillaSpot, for the last five years, has worked with studios and TV networks, such as Paramount, ABC (s dis), CBS (s cbs), MTV (s via), HBO (s twx), AMC, MLB and others, for its products, which include SceneWeaver, a video mashup application, and ReelCards, which provides online premium video e-cards. The company plans on rolling out film and TV content in the coming weeks and months, with many TV clips uploaded within minutes of their airing. Athan Stephanopoulos, CEO & Founder of GorillaSpot told me GorillaSpot has already done a lot of heavy lifting with content owners and shown them how they can monetize their clips in a safe way. Now, he believes many more will be interested in teaming up on Cliptamatic. Some TV networks may release clips, with short 3-second post rolls that promote a current show. Other movie studios may just want to point to their archive of content. And some media companies may just want to get in now to help build Cliptamatic up into a larger sharing platform. Stephanopoulos believes that there’s a ripe opportunity in creating a social video sharing service that is built specifically with mobile in mind, so consumption and distribution is easy. And he said premium content is capable of expressing people’s feelings in ways that user-generated content can’t convey. I think there’s definitely a place for Cliptamatic if it can score the right content. Video is a great conversation starter and tool for expression but I hesitate to use it sometimes because a clip may be too long or I can’t find the right video. And doing it from a mobile device makes it even harder. But if I could find the perfect Will Farrell quote from Anchorman or an illuminating clip from the upcoming debates that, I would love to share it at the right time. Movieclips has some great clips, which are available through YouTube as well, but they’re often a couple minutes long or more and there’s no mobile app. We’re already used to sharing longer videos on Twitter and Facebook but I think we could see a lot more of that if the content was better packaged for quick sharing. And with the popularity of gifs these days, we’re understanding how short video moments are becoming a form of expression. A great thing. Finally, a one stop shop to share and talk about my favorite movie moments!! Too bad Hulu still doesn’t work those outside of USA unless you use DNS services like UnoTelly.com to get past Hulu’s horrible block! Shame it only runs on the dying OS. I am so glad this is ready. What a great idea! Keep up the good work, I am looking forward to the expanded content. I’m loving this app! So fun to find the clip that fits my mood. Love sharing my videos. Well done Cliptamatic!